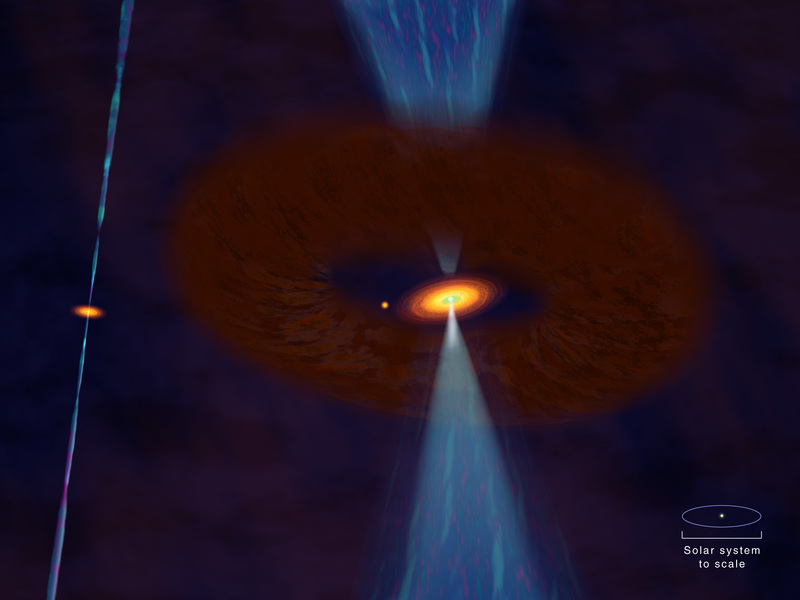 Using a new observing capability of the National Science Foundation's Very Large Array (VLA) radio telescope, astronomers have discovered a solar-system-sized disk of gas and dust feeding material onto a young star with 8 to 10 times the mass of the Sun. This is the first time an inner "accretion disk" has been seen around such a massive star. The VLA images also revealed the inner portion of an energetic outflow of material powered by the accretion disk. Shepherd and Mark Claussen, also from the NRAO in Socorro, and Stan Kurtz of the National Autonomous University in Mexico, presented their findings today at the American Astronomical Society's meeting in San Diego, CA. The scientists made the discovery using the VLA connected by a newly- operational fiber-optic link to one of the radio-telescope antennas of the NSF's Very Long Baseline Array (VLBA), located at Pie Town, NM, 32 miles away from the VLA. Linking the VLA to the Pie Town antenna almost doubled the resolving power, or ability to see fine detail, available to the astronomers. "We could not have seen these structures without using the Pie Town antenna connected to the VLA," said Claussen. Work on the VLA-Pie Town fiber-optic link, financed by the NSF and Associated Universities, Inc., which operates NRAO for the NSF, began in late 1997. The linked facilities first were available for routine astronomical observations last autumn. In late November, the scientists pointed the sharpened vision of the combined telescopes at an object called G192.16-3.82, more than 6,000 light-years distant in the constellation Orion. First observed in 1990, G192.16-3.82 was found to be a massive young star powering one of the largest stellar outflows -- extending more than 30 light years from end to end -- in the entire Milky Way Galaxy. Earlier observations showed the young star is surrounded by a large, rotating disk with a diameter greater than 1,000 times the Sun-Earth distance. Astronomers, however, believed that the outflow had to originate from a structure much smaller than this disk. 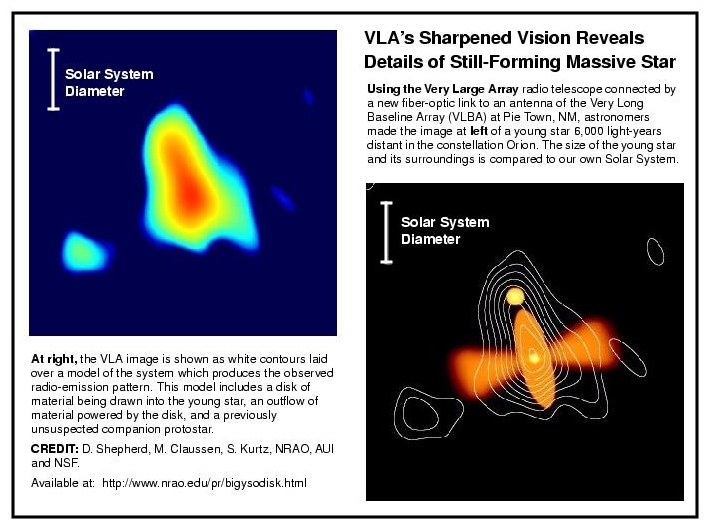 The VLA-Pie Town system gave them their first glimpse of the suspected smaller structure, another disk slightly larger than our own Solar System containing enough gas and dust to make 20 Suns. In addition, they saw the inner portion of the outflow of material powered by that disk. The new observations also showed that the smaller disk probably is truncated by the gravitational pull of another, previously-unseen young star less massive than the first. 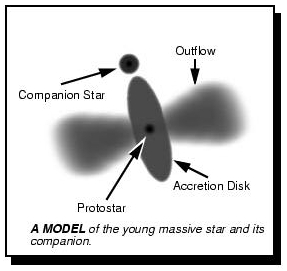 Close to the larger protostar, the outflow is wide, covering an angle of about 40 degrees. "With smaller protostars, the outflow begins wide but then is narrowed down to a thin jet relatively close to its origin. However, when the protostar is more massive, the outflow tends to remain wide," Shepherd said. "We think that magnetic fields narrow down the flow from the smaller protostars. It's possible that when the flow contains much more mass, such as in this system, the magnetic fields may be just too weak in most cases to get this done," she said. "Our new observations now make it possible to test this idea by comparing computer simulations to what we see in the real universe," Shepherd said. The VLA is a system of 27 radio-telescope antennas distributed over the high desert west of Socorro, NM, in the shape of a giant "Y." Made famous in movies, commercials, magazine articles and numerous published photos, the VLA has been one of the world's most versatile and productive astronomical observatories since its dedication in 1980. The VLBA is a continent-wide system of 10 radio telescopes distributed across the continental United States, Hawaii and St. Croix in the U.S. Virgin Islands. Dedicated in 1993, the VLBA has made important contributions to the understanding of stars in the Milky Way, the workings of distant galaxies, and to calibrating the distance scale of the universe. Both the VLA and the VLBA use multiple radio-telescope antennas to produce greater resolving power than is possible with an individual antenna. Because of the different sizes of these two arrays of antennas, they produce images showing different levels of detail. NRAO scientists and engineers have developed plans to combine the VLA with the VLBA antennas closest to it, in New Mexico, Texas and Arizona, along with a number of new antennas, to fill in a gap in resolving power that exists between the VLA and VLBA. If this plan is funded, the closer VLBA antennas and the new antennas will be connected to the VLA by fiber-optic links to produce the Expanded VLA (EVLA). "The successful linking of the Pie Town VLBA antenna to the VLA shows that we can connect these radio-telescope antennas with fiber-optic cable over long distances and make them work as a single instrument," said Claussen, who worked extensively on the project. 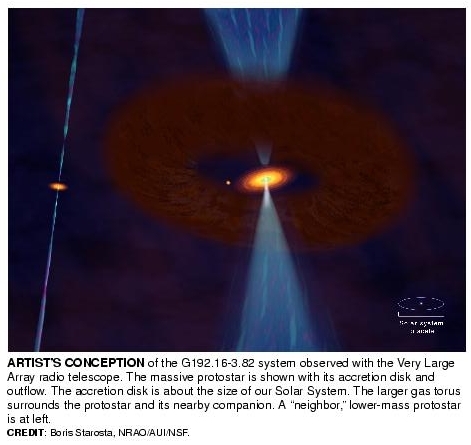 "This has produced a valuable new capability for astronomers to use now -- as shown by our study of this young stellar system -- but it also proves that our concept for expanding the VLA is technically sound," he added.